Yendi's glory days are far behind it. Set in the arid savannah of northern Ghana, the town was once the seat of the ruler of the 15th-century kingdom of Dagbon. Now, it has the air of a small and impoverished provincial capital. The only remaining clues to its pre-colonial might are its plethora of royal palaces. The palaces are home to two rival branches of Dagbon royalty, the Abudu and Andani families, whose competing claims to the throne have been resolved for 200 years by a system of alternating succession. Ten years ago, however, on 27 March 2002, members of the Abudu family stormed the palace of the Andani king, Ya-Na Yakubu Andani II, decapitating and immolating the old ruler and murdering up to 40 other royal servants and advisers. Now, after more than a decade of simmering conflict, the dispute between the two lines seems set to boil over, tipping the region into conflict. The dispute has brought development in Dagbon to a halt and may even, some fear, pull the country apart. Abdoulaye Yakubu Andani, the "caretaker regent" of Dagbon who is his family's candidate to succeed the murdered king, lives in the Gbewaa palace, newly built by the government of Ghana to a level of luxury that far distinguishes Andani from most of his subjects. Neatly framed pictures of former ya-nas [kings] adorn the wall, and a 52-inch Sony Bravia flatscreen TV – current retail price in Ghana about £3,000 – is fixed for ease of viewing from the throne. "What happened in 2002 was inhuman," Andani said. "Forty people murdered in cold blood. So many questions remain unanswered." Next door, the ruins of the old Gbewaa Palace remain a crime scene, surrounded by barbed wire, riddled with bullet holes and watched over by five military guard posts. The Abudu family seat a few hundred metres away is different again. Peeling paint and dangling electrical wiring speak of neglect and poverty. The throne is set in a small clearing in a pile of junk at one end of a corridor, beneath a dirty fan. The only decoration is a collection of useful phone numbers scribbled on the wall and a showbiz-style calendar featuring the Abudu pretender, Abdulai Mahamadu, known as the Bolin Lana. Its glossy pages show a young man who looks a decade younger than his official age of 38, wearing his trademark red animal skin headpiece adorned with various spiritual and magical regalia. Mahamadu spoke only through his guardian, an old man with two teeth and a straggly beard who explains that it is not befitting for Mahamadu to address anyone directly. The new Gbewaa Palace was their true home, he insisted, and as long as it was occupied by Andanis, they would continue their struggle. If there is one thing Abudus and Andanis agree on, it is that politics has played a toxic role in their rivalry, turning the relationship from tolerance – the communities once intermarried and lived side by side – to conflict. With national elections due in December, observers fear the growing anger between the families will spill over into violence during the campaign. The perpetrators of the Yendi massacre have never been brought to justice. A trial last year of 15 Abudus resulted in acquittal, while a manifesto promise by Ghana's ruling NDC party of an official inquiry into the murders never materialised. 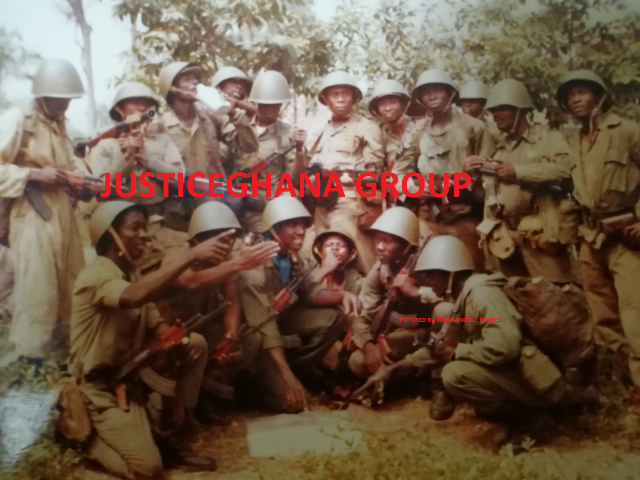 The Andanis insist the party in government at the time, the NPP – currently in opposition – played an active role in the massacre, which it vehemently denies. "Where were the police when our palace was under attack?" Abdoulaye Yakubu Andani said. "Where were the security agents? And the weapons that were used – you wonder that the people of this town had such sophisticated weapons and were firing like people who were trained. We believe that some people were brought in from elsewhere." The Abudus, who admit members of their family perpetrated the killing, likewise have their suspicions as to who fomented the violence. "The pictures of weapons and ammunition retrieved from the palace that emerged after the events of 2002 included a machine gun that you can mount and shoot, countless AK47s, the private car of the ya-na with several guns in the boot," said Dr Ziblim Iddi, a professor of political science at the University of Ghana who speaks for the Abudu family, implying that the Andanis were prepared for a violent confrontation. The Abudus claim a legitimate grievance against the Andanis. They are still seething from a decision by the military regime that ruled Ghana in the 1970s to strip the then-Abudu king, with about 60 chiefs beneath him, of his title. Abdulai IV – Mahamadu's father – died in 1988 but has still not been buried. This issue has played a central role in the deadlock between the two sides. Dagbon is a place of deeply held and ancient beliefs, with a power structure reliant on soothsayers and charms for the most crucial of decisions. "The funeral can only be done in the Gbewaa Palace," said Mba-Dugu Iddrisu, senior adviser to the Bolin Lana. "If the funeral is not performed, he cannot reach the place of the ancestors – how can anything then be resolved?" The Abudus believe the Andanis have created their own fate by endorsing the events of 1974. "[Stripping a king of his title] is not known in Dagbon," said Mba-Dugu Iddrisu. "We have our traditional beliefs. If you wrong the tradition, if something is forbidden and you go against the gods, you will be punished for it." The irony of the situation, which has seen countless failed attempts at mediation and even a formal roadmap to peace led by another famous Ghanaian king, the king of Ashanti, is that the entire community is suffering. The failure to agree on who should become the new ya-na has created a power vacuum, which leaves the region without anyone able to sign leases and process land sales. "There are 20,000 leases pending in the region," said Andani. "We are talking about people coming to invest and create jobs." "I feel it's unfortunate that if someone dies, it means that the citizens in that community should not eat. I am the regent, acting in the capacity of my father. I don't see why I should not sign leases. It is for the benefit of everyone." The crisis has seriously affected investment in the north, according to a source at the government land agencies who did not want to be named. "Most demand for land in this region is from outsiders who want to develop land for commercial use," he said. "A lot of banks are coming here, looking for land to develop and property to buy – filling stations and office buildings should be springing up. The crisis is holding all this up, and that makes this even more serious." The failure of development in Dagbon – which is known somewhat ironically as the development capital of West Africa with its plethora of NGOs and initiatives such as women's shea butter collectives – is a cause as well as a result of the conflict in Dagbon, as both sides in the dispute acknowledge that their most formidable enemy is poverty. "Life in Yendi is hard. We don't have money. As soon as we have finished school we leave – to go to Accra or to other countries. When I finish school I want to go to the USA," said Mohamed Abdullai, an 18-year-old student, a member of the Abudu family and follower of the Bolin Lana. "The problems in Yendi are very, very extreme," said Baba Idrissu, the NDC's MP for Yendi. "There is an absence of security, it puts off investors. Who wants to invest in an area that still has the propensity to have war? Most of the NGOs have fled. When there is any little skirmish the first they do is burn businesses." As Ghana's elections approach, the clear allegiances between rival political parties, and the centuries-old family feud in Dagbon have prompted unease in a region already predisposed to swiftly escalating violence. "We have plenty guns. They came from Europe, from America. We go to buy guns. If people misbehave or they are ignorant, we kill them", said Abdullai, voicing his anger at the refusal of the Andanis to allow the funeral of Abdulai IV. It is the potential of this anger to spill over into other parts of Ghana that causes the most serious alarm here. Dagombas, as members of the Dagbon kingdom are known, are the second largest ethnic group in Ghana and by no means confined to the rural north of the country. "The ya-na murder set a precedent for violent murder, and people are very bitter that their king was treated in this way," said Andani. "Any crack in the Dagbon kingdom is going to escalate everywhere else in the country."